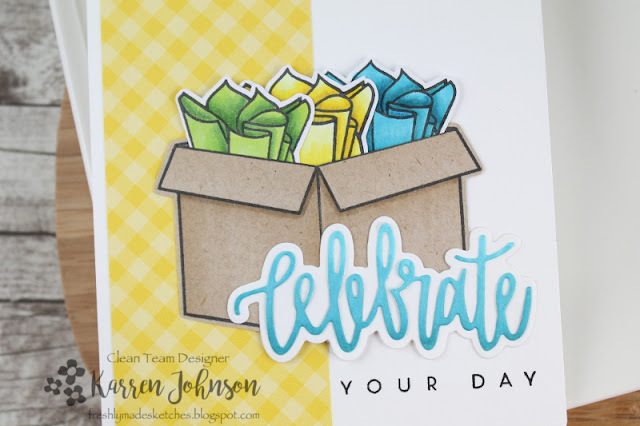 I had some fun with this sketch and came up with a bright and cheerful birthday card. I stamped the box onto Desert Storm cardstock and cut it with my Scan n Cut. I then shaded the sides of the box with a Copic marker. I also cut a slit across the top of the box and creased the edge to give it some dimension. I colored the wrapping papers with various Copics and again used my Scan n Cut to cut them out. After arranging the papers inside the "box", I used some foam tape to pop up through the centre of the box and adhered it to the card base over some patterned paper. The sentiment was die-cut after coloring a piece of white cardstock with Copic markers in an ombre fashion. The rest of the sentiment came from a PTI set. Thanks for visiting! Please head on over to check out the cards by the rest of the design team. Karren this is so fun ... who cares what's buried under that delish tissue? 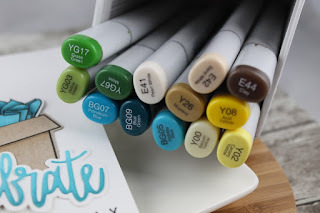 You always have such fabulous details -- like the shading on the box, inserting the papers into the box, the ombre sentiment... I could go on. I always have such fun looking for all these special touches. I love how you used the sketch, and I love the bright colors. Love this! The yellow and blue combo is wonderful with the bit of green! Really fun birthday card, Karren! 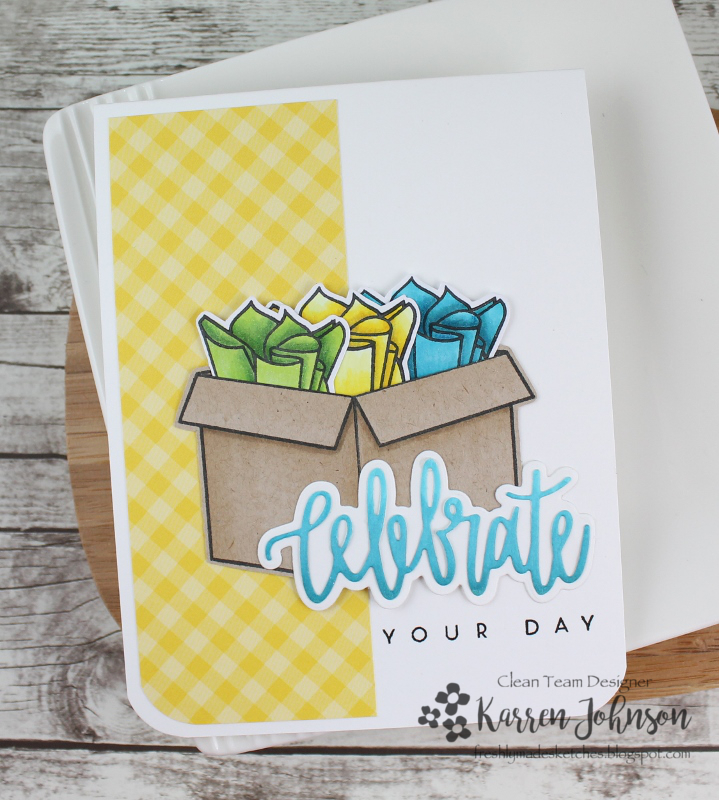 I love the gingham papers and how you colored the tissue paper to fill the gift box! 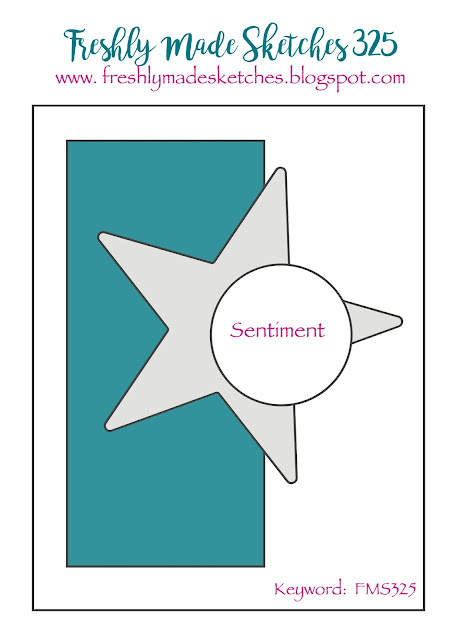 Love your layered die cut sentiment, too! Super celebratory! Thanks for sharing! This is such an amazing card Karren! I love that box and the multi-coloured tissue paper! That background paper looks perfect and it's all so cheery! You're making me want a Scan n Cut!!! Love this card!! And I love that it is a great gender neutral card too... I seem to never have enough of those!! That gingham is awesome. Bright and cheerful it is - and perfectly coloured too! You always have perfectly detailed cards Karren!